On Thursday, June 30th, 20 veterans and supporters from all generations will bicycle 335 miles from Pittsburgh to Washington, D.C. to honor and support local veterans on 4th of July weekend! The team will leave from VLP’s offices. Before you head to work, you’re invited to join us for coffee, bagels and a hearty send-off celebration that will get our riders pumped for their 335-mile journey to our nation’s capital on their bicycles. 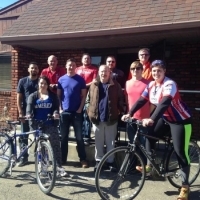 Each rider is participating in 335 Miles for Veterans to raise money for the men and women who come to VLP during their critical time of need. In just four months, the team has raised more than $23,000! Click here to support the team. *Parking: Please plan to park on the street as our parking lot will not be open. There is meter parking in front of our building and free street parking behind our building. WHEN? 8:00 a.m. – 9:00 a.m. *Arrival: Please plan to arrive at least 10 minutes prior to 8:00 a.m.
RSVP We want to have enough coffee & bagels for everyone. Please RSVP here or email info@vlpwpa.org.